There’s nothing great as having quality music in your marine vessel. However, it’s not easy to get quality music in a boat. Maybe you already have quality speakers and subwoofers in your boat but the quality of sound and volume are still low. What could be the problem? Well, you’ll need to add a marine amplifier to your boat music system. An amplifier works by increasing the overall amplitude of audio signals. This way, you’re able to boost audio signals without compromising on their quality. But how would you know the best marine amplifier for your marine vessel? Considering the different types of marine amps available in the market, making the best choice becomes quite challenging. 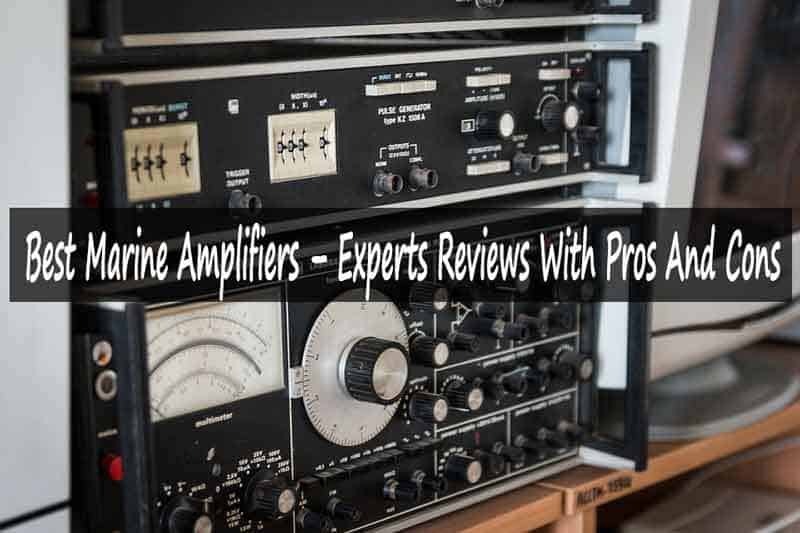 However, we have made your selection process easier by reviewing the best marine amps you can ever find on the amp market today. Read on through this article for a detailed marine amps review. It’s never easy to choose an amp for your boat or any other marine vessel. We acknowledge this challenge, that’s why we have prepared this review. We started by gathering research from existing studies and reports on the top amplifier brands. This enabled us to know the must features that a marine amp should have. In addition, we analyzed the experience of real users on the amps they perceive best for the ever harsh marine environment. We also gathered detailed information from product experts. The information we gathered enabled us to narrow down the list we had and only reviewed the very best amps. The importance of this research review is to make it easier for you to get the best deal for you’ll only choose from the best options. These options reviewed here include everything that marine amps should have. Therefore, you’ll not have to look any further. The Kenwood 1177524 amplifier offers great value for your money. It stands out in that it comes with advanced Bluetooth functionality. You can easily connect Bluetooth capable devices effortlessly to the amp. This way, you can carry your mobile device music to your boat and connect wirelessly. Wireless controls: The amplifier comes with a wireless remote control for adjusting the volume and changing music tracks. The remote control makes it easy to control the amplifier from anywhere around your boat within the suitable radius. Compact design: This amp has a compact design unlike some of its competitors that appear bulky. Its compact design makes it possible to fit even in the smallest spaces in your boat while still making it easier to conceal. Class D amplifier: The Kenwood 1177524 is categorized as a Class D marine amplifier, and this comes with many benefits. For instance, it minimizes power wasted as heat and has higher conversion of amplifier power. Bluetooth technology: This amp is one of the few marine amps that boasts of having Bluetooth capability. Its Bluetooth functionality allows a user to connect their Bluetooth capable portable devices such as smartphones and music players to their boat. Four channels: You will be amazed to find out that this amplifier comes with 4 channels. This means that you will be able to connect more speakers, including a subwoofer for enhanced audio and bass. Our Verdict: Overall, this amp performs exceptionally well at its price. It’s ideal for anyone who needs an amp with Bluetooth functionality. However, you might require an amplifier with more power for larger speakers. The Pyle Hydra PLMRA420 is designed as a bridgeable amp. It has 4 channels that can be bridged into 2 dedicated channels. Bridging the amp channels makes it possible to increase its overall power output. You can bridge its channels to power a more powerful marine subwoofer for enhanced bass. Powerful outputs: The amp is designed to give a peak power of up to 1000 watts and RMS rating of 35 Watts at 4 ohms or 50 Watts at 2 ohms. This means that the amplifier can power larger speakers and uses dual MOFSET powering mechanism. Gain level controls: The amp stands out for having responsive controls for gain level. You can easily use these controls to maintain the most suitable amplitude at the output even if the input amplitude has some variation. Protection against short circuit: Another feature that stands out in this amplifier is its aluminum alloy based heat sink and short circuit protection. They work by preventing the electric system of your boat from shorting the amp. Low and high-pass filters: It’s worth noting that this amplifier comes with low and high pass filters. The filters keep off unwanted frequencies in a sound signal, thereby ensuring the output signal is free from distortion, thus enhancing the quality of sound. Gold plated terminals: All the connection terminals of this amplifier are plated with gold. Gold plating protects the terminals from corrosion, thereby allowing making it more likely to use the amp for more years. Our Verdict: If you’re looking for an affordable yet powerful amplifier, then you should include Pyle Hydra PLMRA420 in your shortlist. You’ll only lack wireless control but still enjoy greater features. This amplifier stands out from others in that it comes with a remote control. This makes it easy to control the amp wirelessly such that you can control it while in its concealed location. The wireless control uses Bluetooth technology such that you don’t have to point the control directly to the amp. USB port: A major feature that comes with the Boss Audio MC900B is its USB port. You can use the USB port to charge your mobile devices such as a smartphone or music player, thereby eliminating the need to use a separate charger. Soft touch control buttons: One feature you’ll truly appreciate in this amplifier is its soft touch control buttons. The buttons are very responsive to touch, thus you’ll never struggle to make any controls as they respond easily. Auto re-connect functionality: Any already paired Bluetooth devices auto re-connect whenever they’re in range to this amplifier. This means that you’ll never have to pair a device all over again to connect it via Bluetooth since it will regain connectivity automatically. RCA support: This marine amp comes with support for 3.55mm to RCA. Therefore, you can easily connect the amplifier with any device that has a 3.55mm output. Surface mount: The Rockford Fosgate TM400X4AD is designed as a surface mount amplifier. This means that you can mount it almost on any surface on your marine vessel, such that you’ll not be limited on where to mount it regardless of space. Our Verdict: Boat owners looking for an affordable marine amp with Bluetooth support and wireless control should include this amp in their shortlist. Moreover, you can charge your connected Bluetooth device with its USB port. However, you can only pair one device at a time. The Rockford Fosgate TM400X4ADis one of the best marine amplifiers. It stands out in that its controls are mounted on the top of the amp. Therefore, these controls make it easier to access the amp’s crossover for more functionalities. The controls support most of the functionalities that an amplifier should have. Dual fans: One of the most outstanding features of the Rockford Fosgate TM400X4AD is its dual fans. The fans cool off the amplifier as it continues powering your marine speakers and subwoofers, thereby making it usable for prolonged periods without overheating. Dual heat sinks: You’ll also appreciate the dual heat sinks built in this amplifier. They allow for more heat dissipation from the circuit board, thereby preventing the issue of overheating when used for longer periods. LED clip detection: Rockford Fosgate TM400X4AD comes with LEDs for clip detection. This enables a user to stay alerted whenever the amplifier produces a wider wave than the supplied voltage to avoid damaging the speakers. Weather proof: The amplifier is specially designed for the tough sea environment. It’s weather proof such that it does not allow moisture to seep into the interior components. High efficiency: The class-ad technologies behind this amplifier makes it one of the most efficient amps out there. It offers superb performance at all times regardless of the environment. Our Verdict: If you want a high-end amplifier that delivers the best audio in all aspects, then don’t mind spending more on this amplifier. Although it’s relatively costly, it gives you great value for money considering its high efficiency. The Clarion XC2410features unmatched resistance to interference from external noise. Therefore, it’s able to reduce distortion such that it delivers quality signals to the speakers or subwoofer. Despite its top-notch quality, its affordability is something that cannot go unnoticed. Corrosion resistance connectors: The connectors that come with the amplifier are nickel plated to resist corrosion. They’re ideal for the moisture-filled and salty sea environment. MOS-FET based power supply: The power supply of the Clarion XC2410 is based on MOS-FET technology. This technology enables the amplifier to yield more power despite its small size design. High quality circuit board design: This amplifier comes with a circuit system designed to resist magnetic noise. This way, it’s able to reduce distortion of signals, thereby delivering high quality signals. Coated circuit board: The Clarion XC2410 boasts of having a coated circuit board. The coating protects the amplifier from water damage. Pulse width modulation: This amplifier is notable for its pulse width modulation capability. This technology allows for enhanced power output despite the small size of the amplifier. Our Verdict: If you are looking for a really affordable marine amplifier, then you should consider the Clarion XC2410. It’ll serve you just like the expensive options, but it does not come with Bluetooth functionality and wireless control. Investing in powerful marine speakers or subwoofer for your marine vessel will surely add to the overall music experience. Although you may have already invested in the best speakers and subwoofer, you can still enhance the music system of your boat by adding a marine amplifier. However, the question you might be having in mind is how you will know the best marine amp for your boat speakers or subwoofer. There’re several factors you’ll need to think about to assist you in making a more informed choice. Read on for the things to consider before buying a marine amplifier. Before investing in an amplifier for your boat, you should consider the total number of channels it comes with. This is basically determined by the number of speakers and subwoofers you have in your vessel. In case you’ll be using multiple and larger speakers, including a powerful subwoofer, then you will need to choose an amp with many channels. For instance, a three channel amp would be sufficient to power two speakers and a single subwoofer. You can go for an amplifier with five or six channels to power more speakers. You may also bridge some amp channels to enhance the power output especially when powering amore powerful subwoofer. An amplifier’s RMS power rating indicates the power rating that will make each connected speaker sound best. Higher RMS power results to better audio quality. However, you will have to consider the maximum and minimum RMS power rating for the speakers as well. In most cases, subwoofers demand higher RMS rating when compared to speakers. Thus, consider the RMS of your marine speakers and subwoofer before investing in an amplifier. Some marine amps do not come with installation kits. If you’re not careful, you might end up buying an amp that does not have wiring or a matching installation kit. In such cases, you’ll be required to order separate installation kits. The best way forward is investing in an amplifier that comes with an installation kit that is ideal for the sea environment. In general, the installation kit should come with marine rated cables and any other necessary connectors. Also, the amplifier should be easy to install even in smaller spaces. Amplifiers often come with controls that allow you to take charge of the sound they produce. Some controls make it possible to keep off unfavorable frequencies, thereby reducing distortion. Therefore, you should choose an amp that has high/low pass filters. For instance, filters for high pass redirect low frequencies away from speakers and filters for low pass redirect high frequencies towards the speakers. The result is getting enhanced audio quality as a result of reduced distortion. If you want to get powerful bass to your subwoofer or speakers, then you should consider investing in an amplifier that has bass boost capability. However, extreme bass boost may lead to distortion. Thus, it’s recommended to balance filters for low pass with bass boost for better bass without distortion. Different brands of marine amps cost differently. Your budget will surely determine the brand of amplifier to invest in. However, you shouldn’t base your choice on the cost factor only. You also need to consider other factors. What you need to do is create a balance between cost and quality without compromising on either factors. Moreover, investing in costly amps does not necessarily mean that you’re getting the best amp. Some amps are affordable yet efficient. Thus, consider all other factors besides cost, but don’t overpay. Investing in a marine amp will surely enhance the overall quality of audio you get from the receiver. Using more powerful speakers and subwoofers without an amp will not allow you to enjoy all the benefits of your boat stereo or receiver. By getting the best marine amplifier, you’ll get more bass, better sound quality and higher volume with less noise. While the amplifiers reviewed in this article share some functionalities, each amplifier has an outstanding feature. Moreover, these amplifiers have multiple benefits and an equal share of shortcomings. Regardless of their similarities and differences, each amplifier is unique in its own way. Whichever brand you choose from those reviewed here, you’ll love its benefits. Nevertheless, remember to make your choice based on factors such as the number of channels, RMS power, and ease of installation, bass boost, and cost. With these tips and review in mind, you’ll surely make a more informed choice and rest assured of getting the best deal.